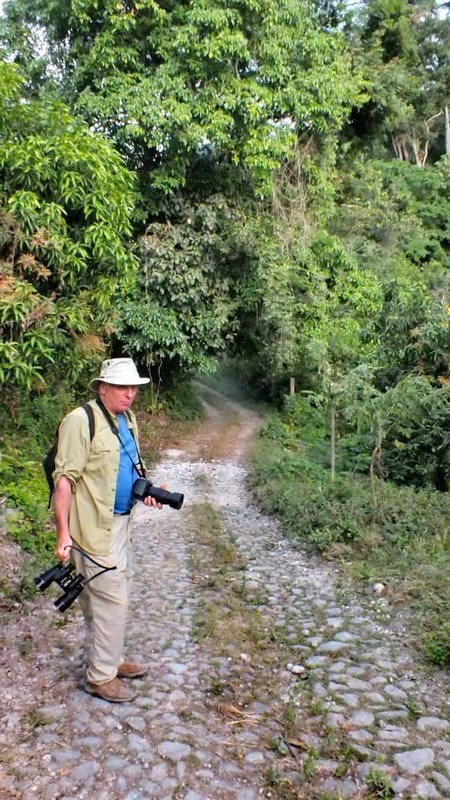 Having left Cerro de San Juan Ecological Reserve behind us in Tepic, Bob determined that there were still sufficient daylight hours to make a stop and go hiking near La Bajada. 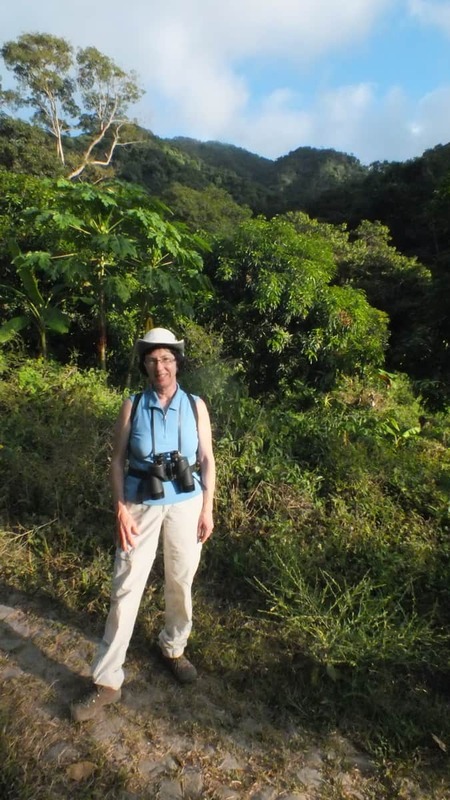 The coffee and banana plantations in that area promised good birding habitat, and it wouldn’t be too far off our route back to San Blas. 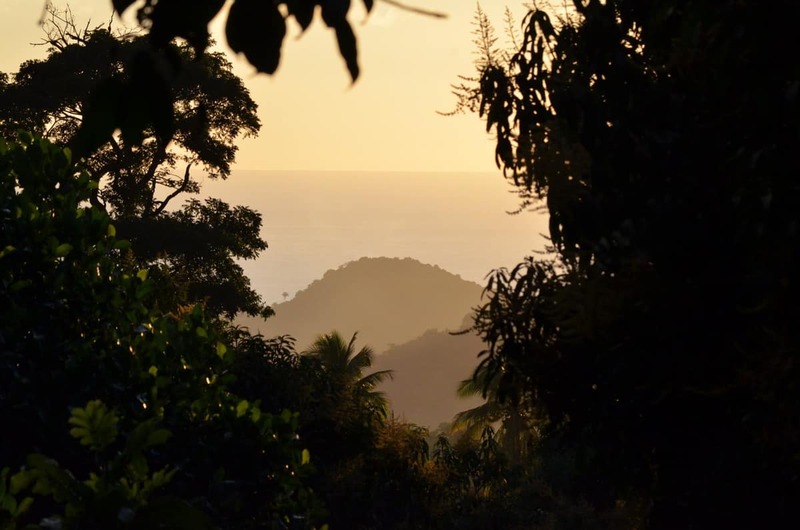 As we neared one little town called La Palma, there was no doubt that we were climbing into the foothills of the Sierra Madre. 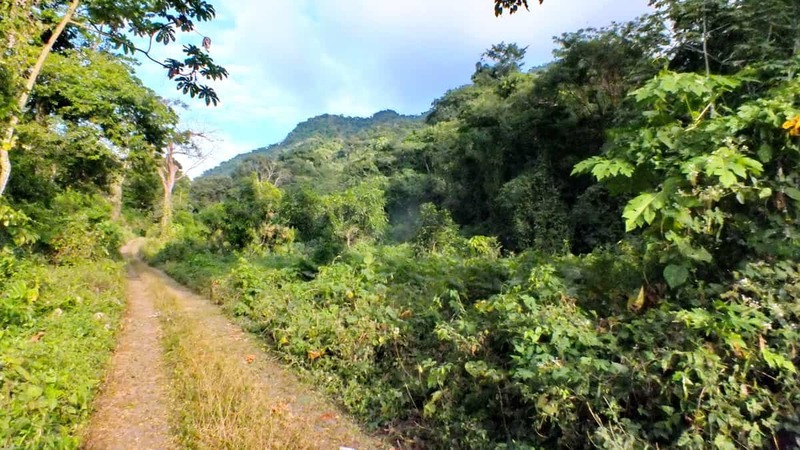 Forested peaks loomed high in front of us, dense with natural vegetation. 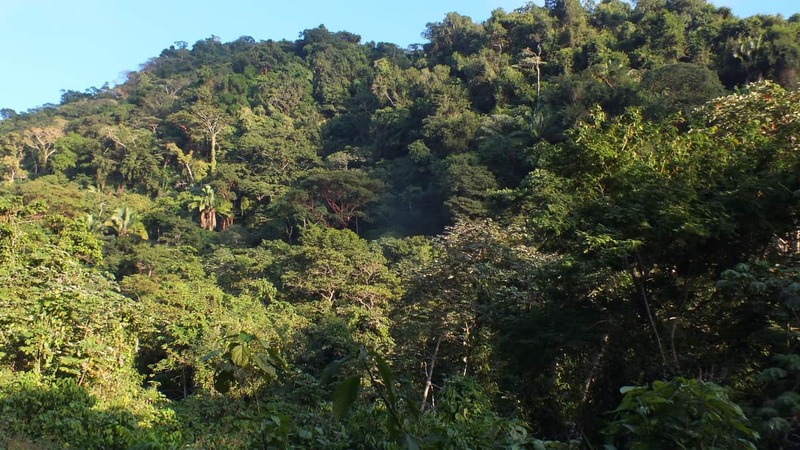 The thick mist that cloaked the canopy as we were leaving Cerro de San Juan Ecological Reserve had thankfully not enveloped the jungle near La Bajada, but we did see veils of mist rising in a couple of spots. 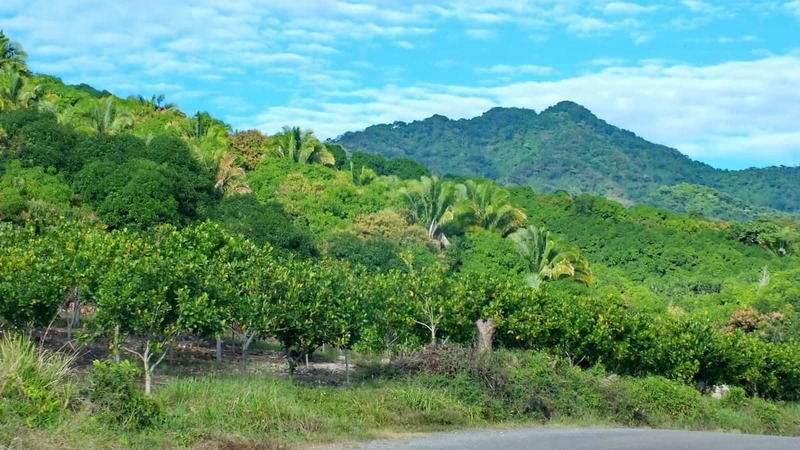 Even nearer La Bajada, the natural landscape prevailed despite the extent of cultivated agriculture in the area. 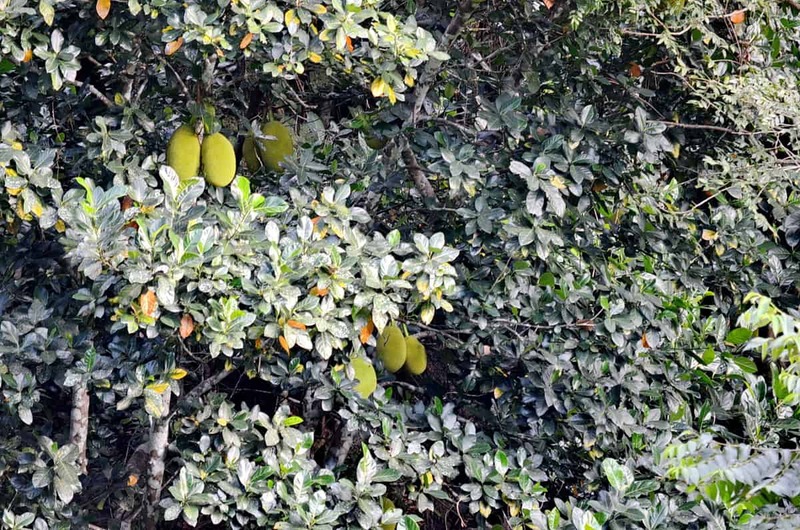 one species of tree bearing a fruit totally unfamiliar to us that later we identified as Jackfruit. 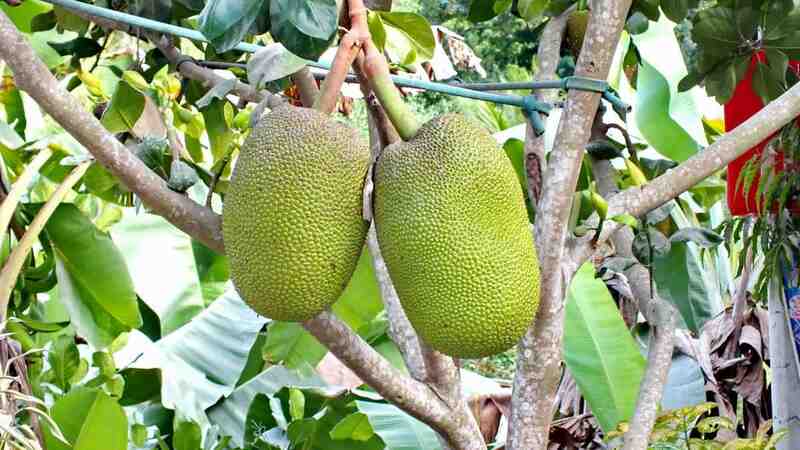 Jackfruit is the largest tree-borne fruit in the world with each individual fruit possible of growing to 35 inches long and 20 inches in diameter. 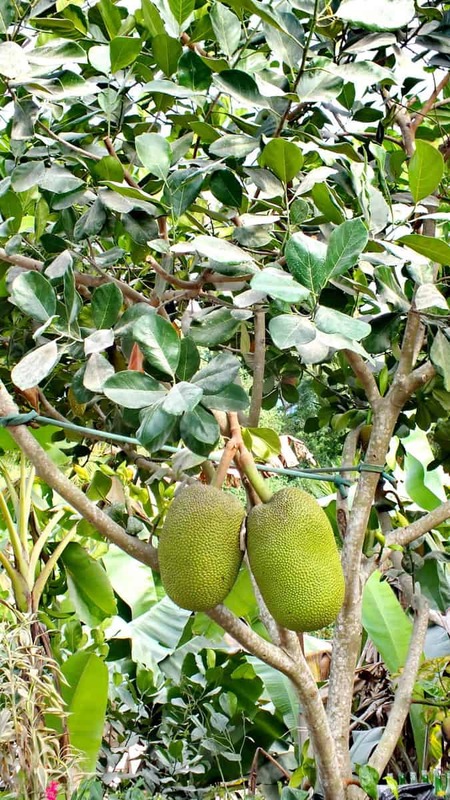 Tropical lowlands as exist between the Sierre Madre and the Pacific Ocean provide perfect conditions for Jackfruit Trees to thrive. 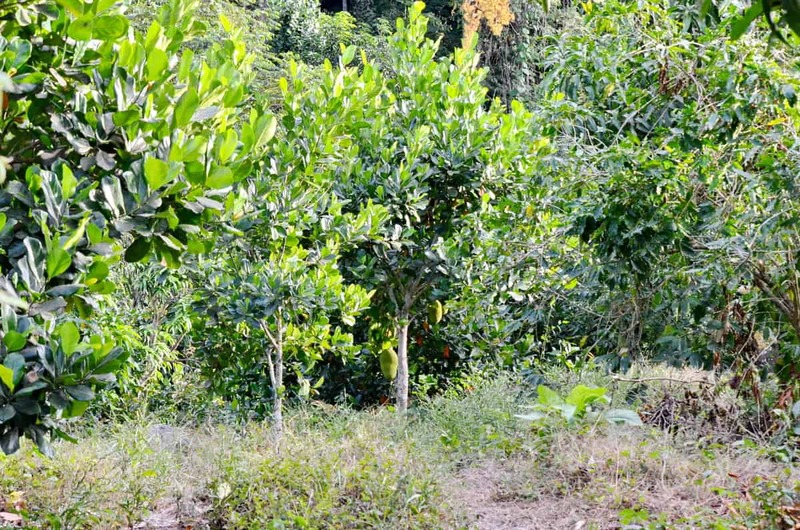 A mature Jackfruit Tree can produce between 200-300 fruits per year, and judging by the size of some of the trees we saw, I’m sure they would soon be drooping under the weight of that many ripe fruits. whereas others appeared purposely planted and cultivated in structured plots easily accessible from the road. 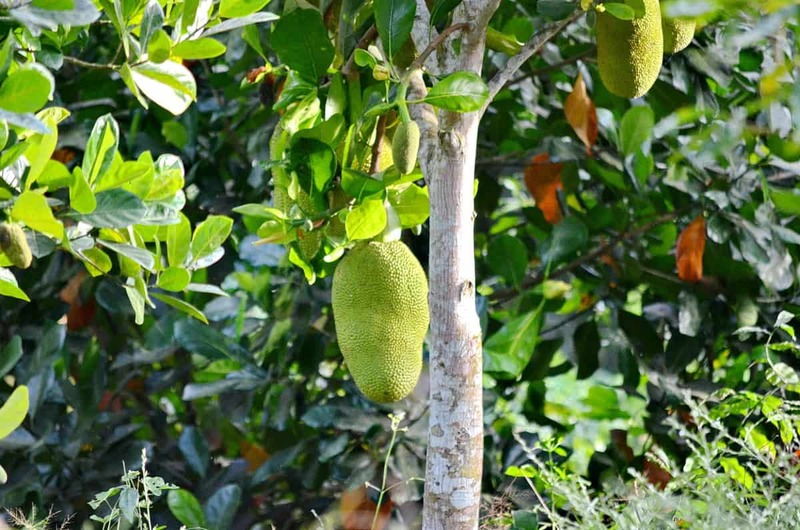 Had we known that Jackfruit has a flavour profile resembling a combination of apple, pineapple, mango and banana, we might have been tempted to pick one of the large fruits if someone had been available to grant permission. 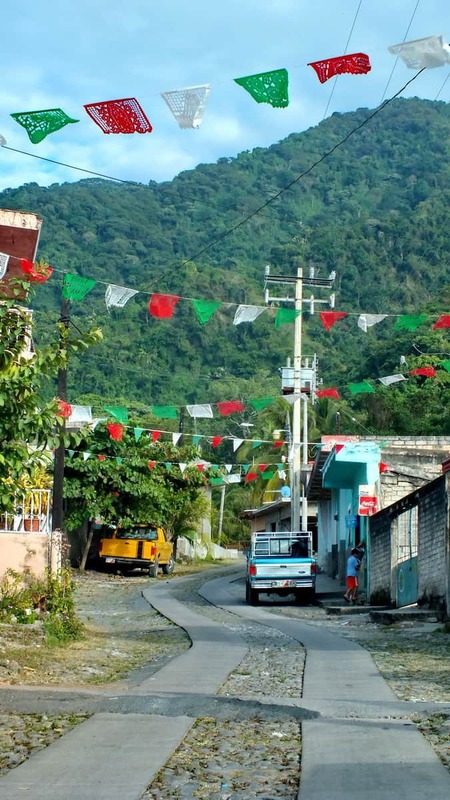 The narrow, sinuous road that connected La Palma to La Bajada gave way to an even more constricted lane that snakes between humble businesses and homes lining the main street. 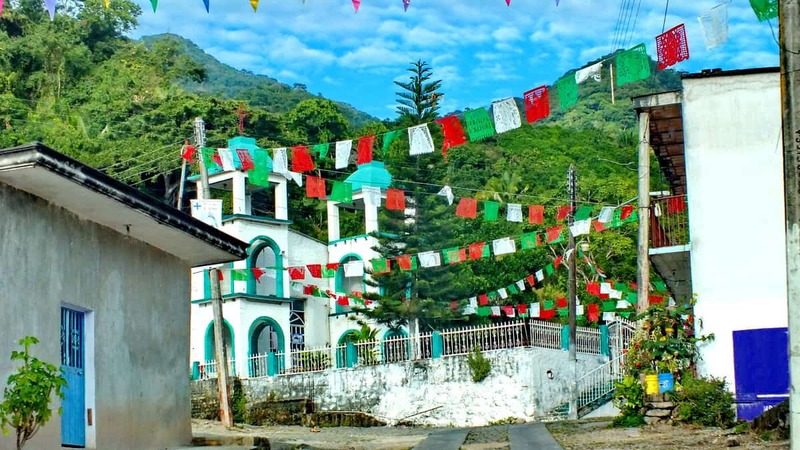 The whole atmosphere of the little community was quite festive with red, white and green banners gaily strewn overhead. Adding to the celebratory air of the location were the buildings themselves painted in pastel shades of turquoise, coral, and pink. 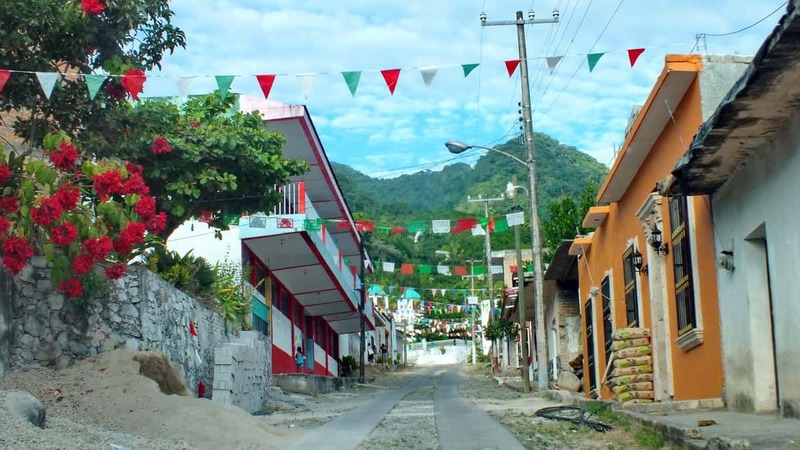 We were unaware of the occasion being celebrated by the residents of La Bajada, maybe a festival commemorating some religious or historic figure because each community is known to have its own unique festivals apart from those celebrated by the whole country. Iglesia Cristiana Bautista was also regaled with colourful pennants. 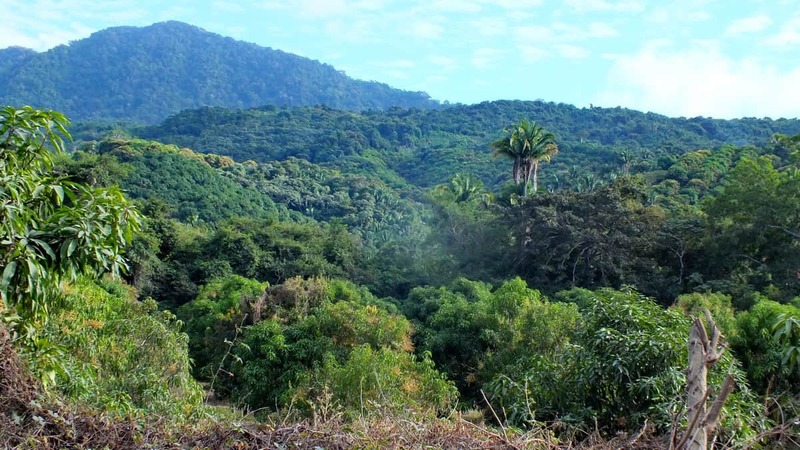 Once we wended our way through La Bajada, we found that the town ended where the jungle met the plantation. 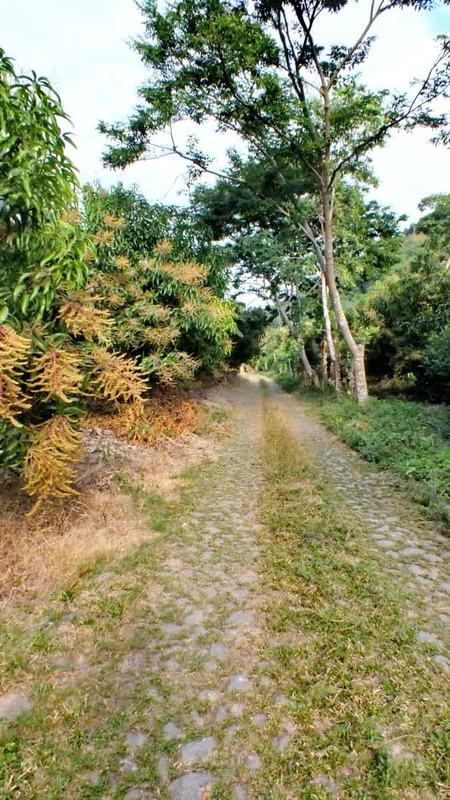 Intrigued by the cobblestone laneway that was set between cultivated plots of the plantation, we drove a little bit further up the mountain to get away from prying eyes. 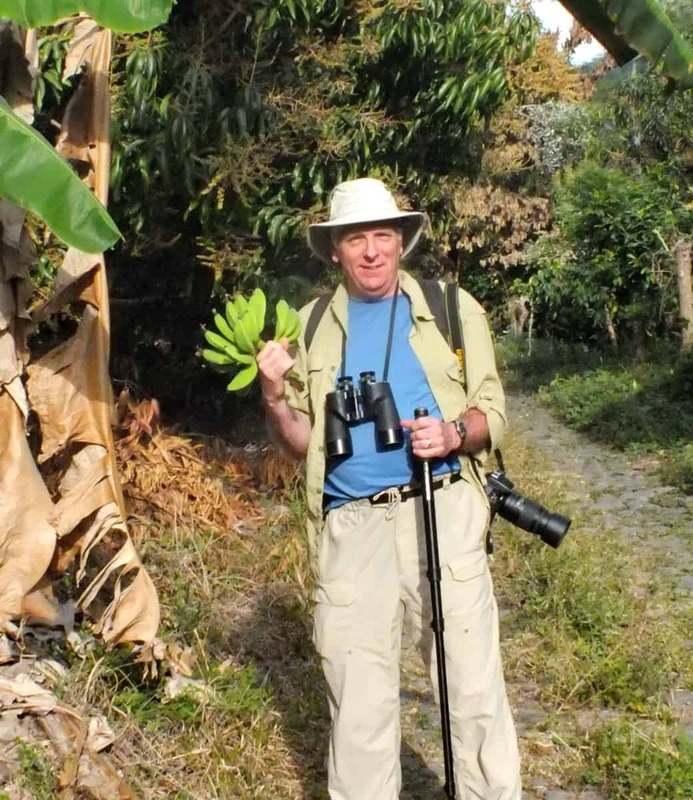 With our rental car tucked in under some banana palms, we hopped out and began exploring and hiking. 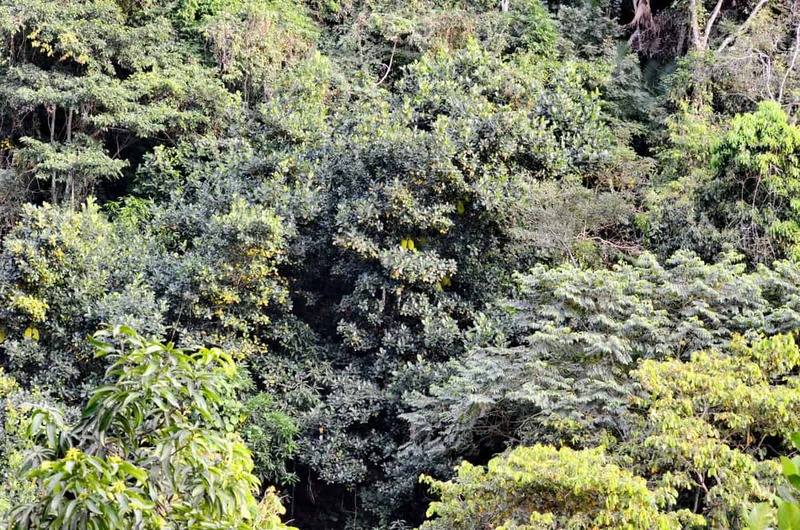 Previously recognized as an area of highly-productive coffee plantations, the banana production has now spread into some of the shade-growing coffee habitat resulting in lower yields. 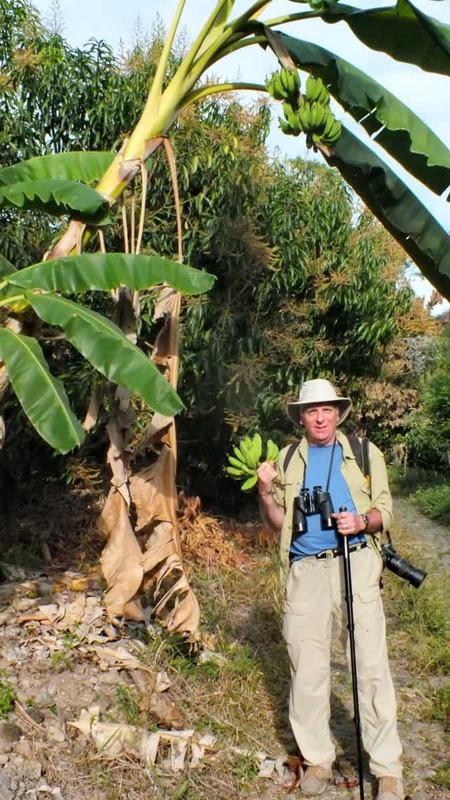 We were not so bold as to pick a cluster of green bananas, but Bob did seize a bunch that was laying on the ground for a photo op. 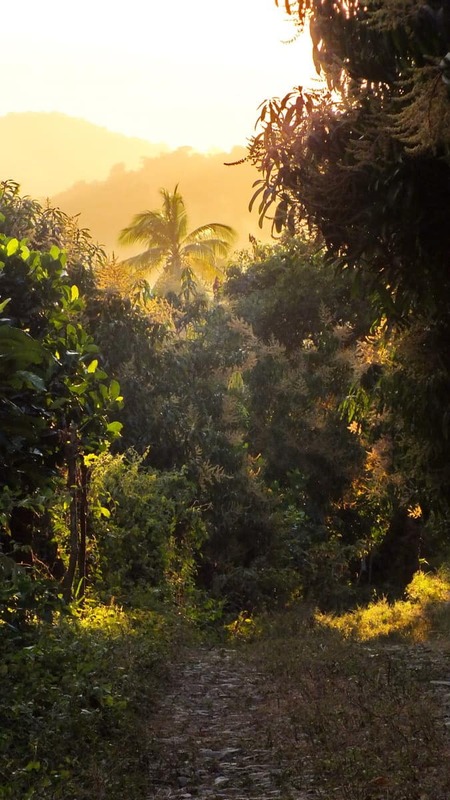 Lush green tropical forest surrounded the banana and mango plantation, with native trees marching up the sides of the steep hills. 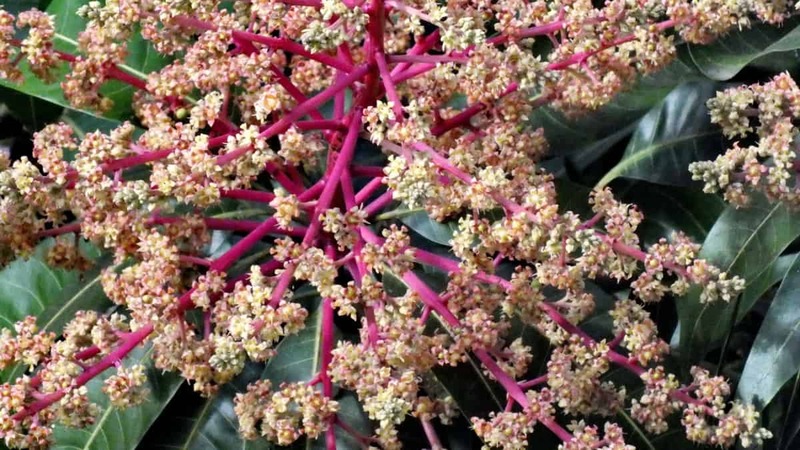 At eye level, we were able to examine the complexities of mango blossoms, but it would be 4-5 months before juicy mangoes would be ripe for the picking. 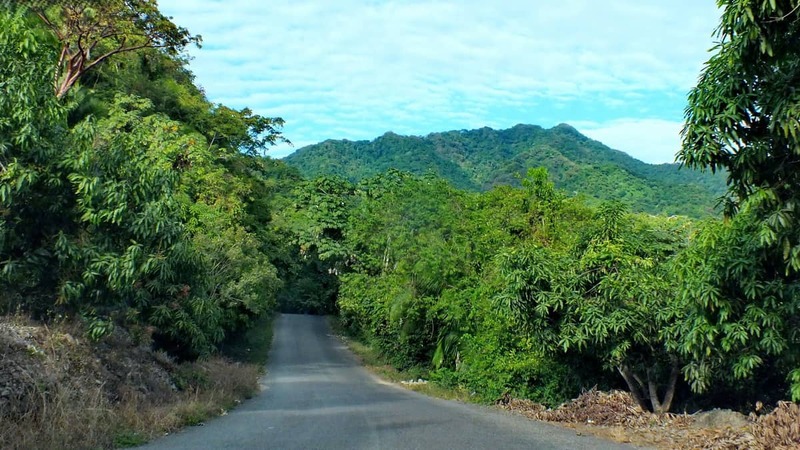 Bob and I continued hiking up the mountain on what soon became a rough dirt road, but there, deep in the mountain valley amid towering palm trees and lush vegetation, we were spared the heat despite increasing humidity. 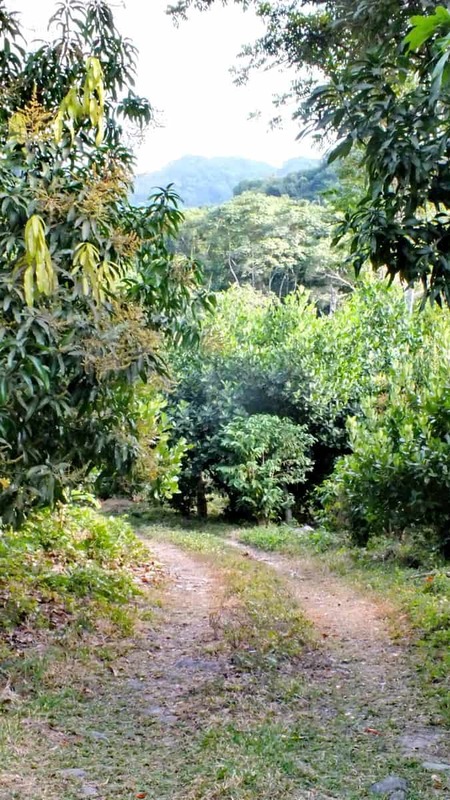 The dirt road soon became shouldered with dense bushes and shrubs as we moved further away from the banana and mango plantation. 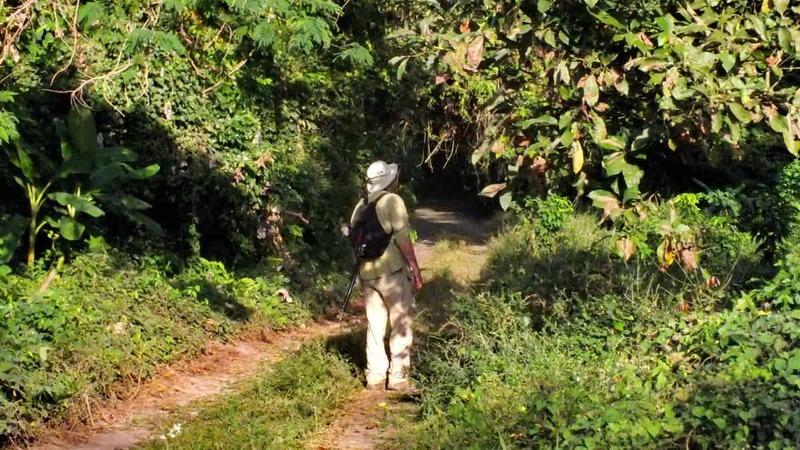 In fact, if desired, we could have hiked all the way through the mountains from La Bajada to Jalcocatan on this trail that is the remains of the original Camino Real. 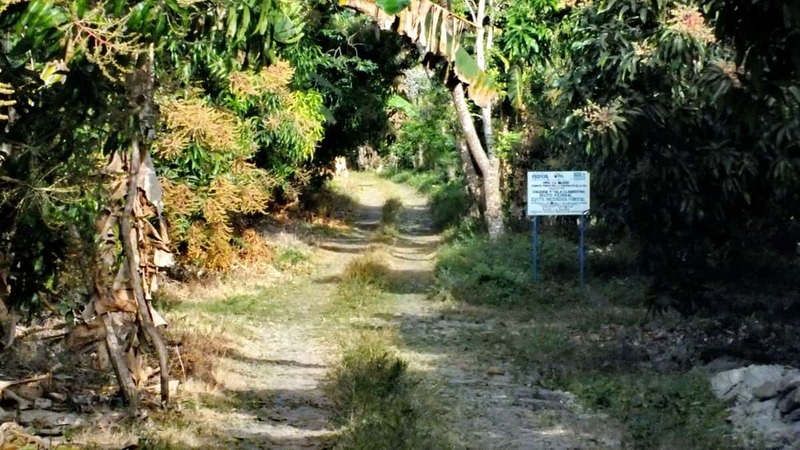 That 6-mile long stretch is a small section of the once popular and significant Camino Real de Tierra Adentro, the inland royal road that connected San Blas, Tepic and Guadalajara. 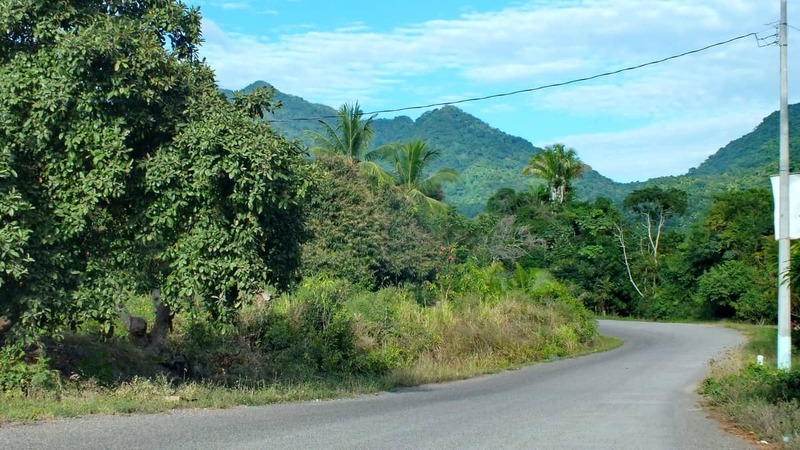 Passing through the mild Sierra valleys to the coast, the Camino Real contributed to San Blas becoming a significant seaport and even figured into the new political identity of the area, the Mexican state of Nayarit. 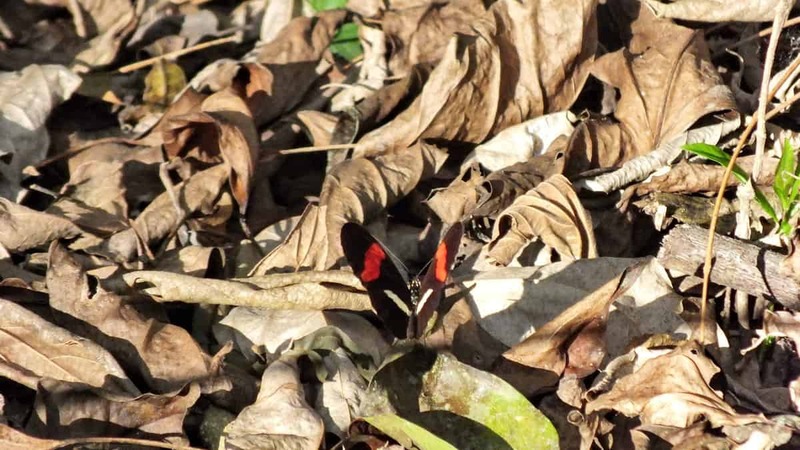 Despite its reputation for excellent birding, the plantation yielded us nary a bird, but some very colourful butterflies had us putting our cameras to good use. 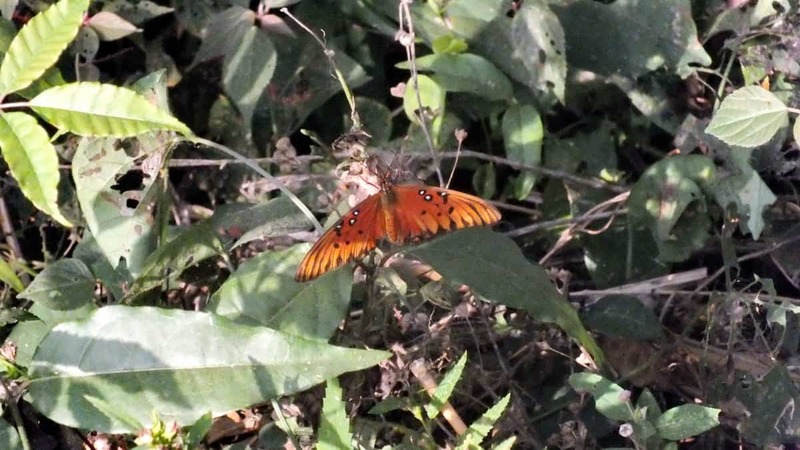 A Gulf Fritillary Butterfly perched alongside the trail seemed to be resting in the partial shade at ground level. 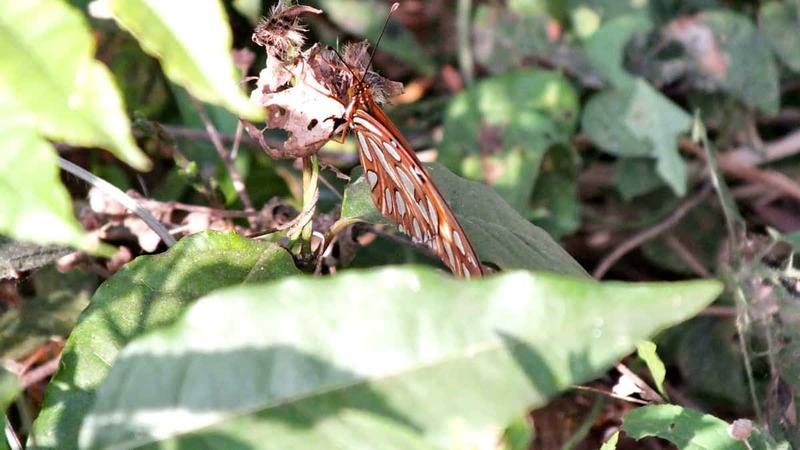 Glance away for a moment, and we lost sight of the butterfly because the pattern on the ventral side of the wings camouflaged the butterfly on the sun-dappled groundcover. 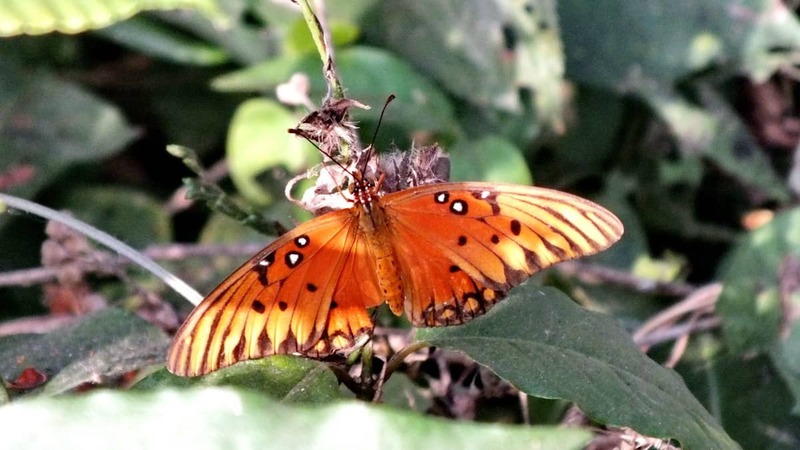 This species of longwing butterfly is medium-sized with long narrow wings that are deep orange. It certainly lit up one shady corner. 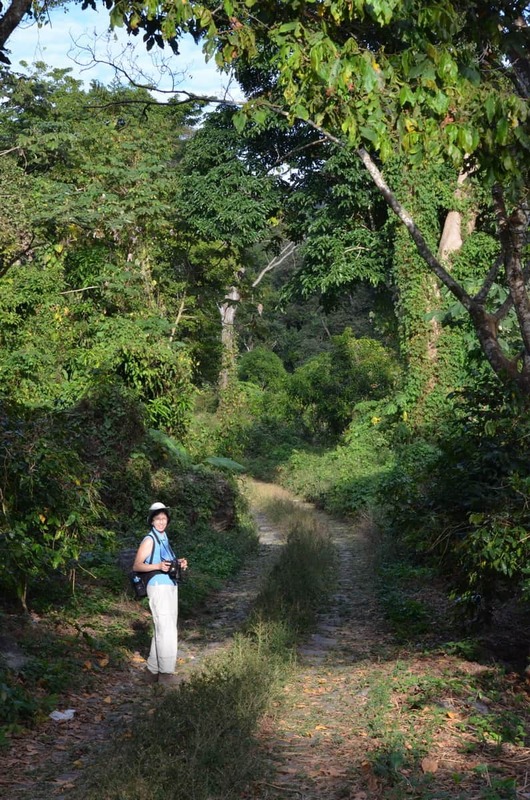 Where sunshine could penetrate the canopy of trees, our chances improved for seeing more butterflies. 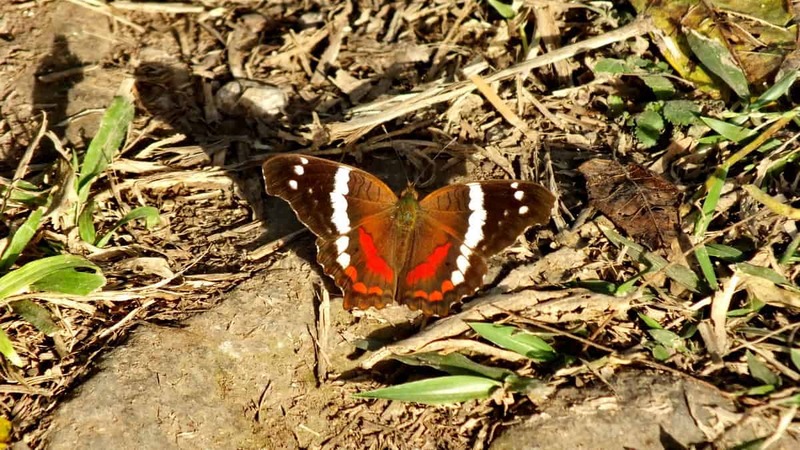 We had a quick look at this Banded Peacock Butterfly before it took flight and disappeared, but it left a lasting impression because of the brilliant red broken median band on its hind wings. 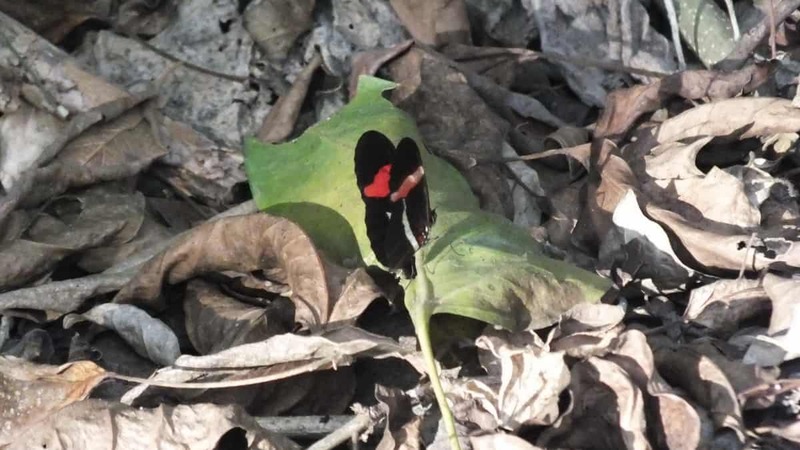 The third species of butterfly that we came across as we hiked along the trail was one that goes by the name the Red Postman or Crimson-patched Longwing. This is a remarkable species of butterfly for two reasons. One, it exhibits Mullerian mimicry, which means that it and other similar species co-evolved to resemble one another so that their colouring warns predators against attacking. 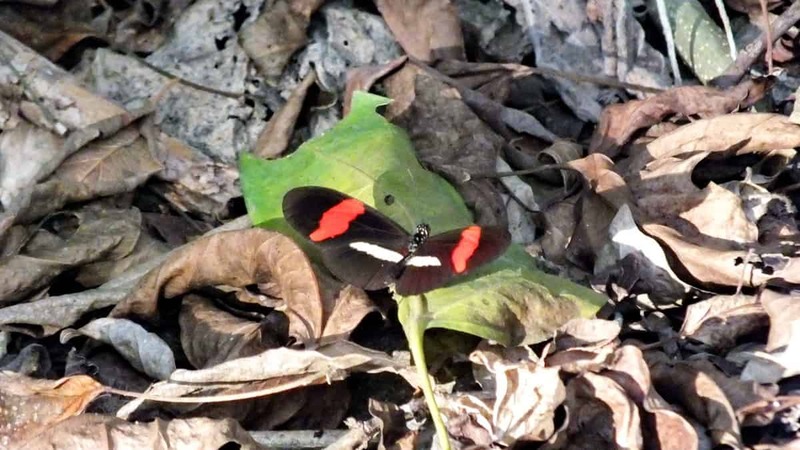 The other fascinating fact is that a Crimson-patched Longwing Butterfly gathers little nectar but instead concentrates on gathering pollen on its proboscis. By coiling and uncoiling its proboscis, a butterfly agitates the pollen causing nutrients to be released for the butterfly to consume. 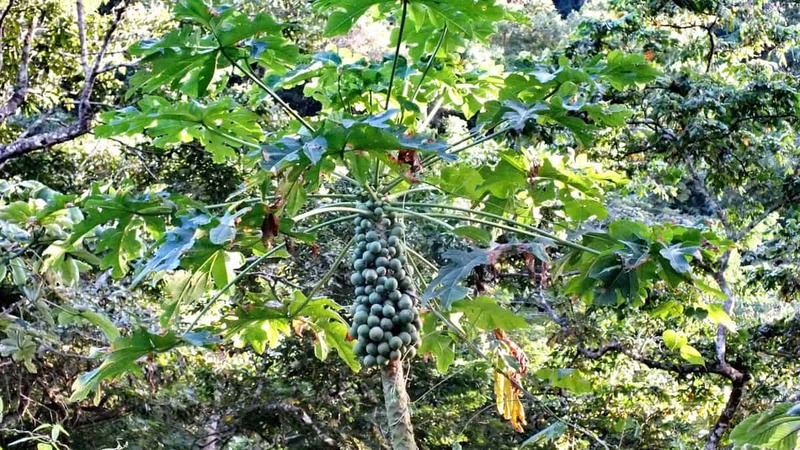 Papaya Palms were heavy with green fruit high above our heads, and it was interesting to learn that this fruit that we eat so frequently actually goes by the name Pawpaw Fruit as well. 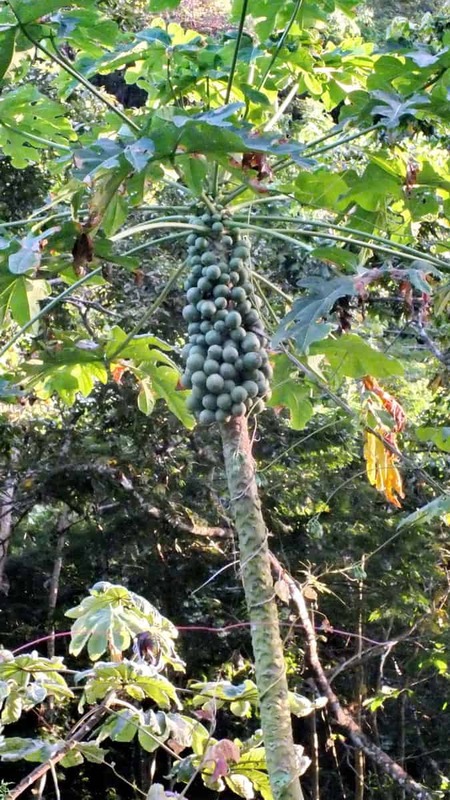 If we looked closely at the single stem of the tree, it was possible to see the scarring caused by successive years of leaf growth and fruit production. Listening intently for sounds in the jungle, Bob and I were surprised to hear the clopping of hooves in the distance. 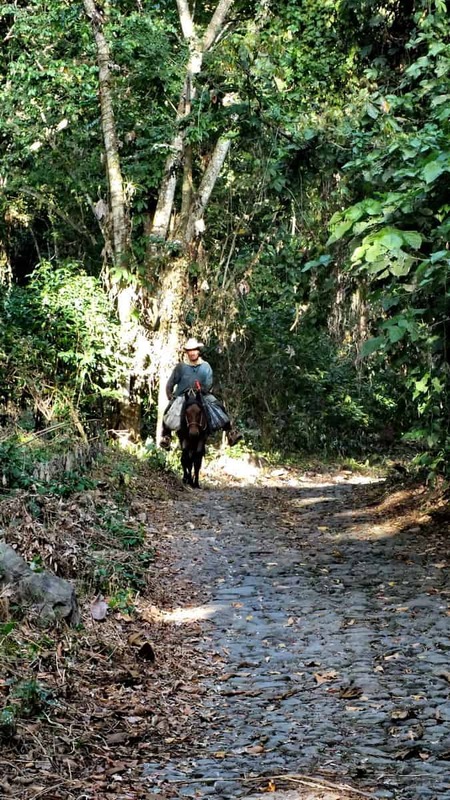 Be it a horse or a mule, the rough cobblestone surface did little to mask the telltale sound of an animal approaching us. How surprised we were to see a Mexican cowboy, a charro, round the near corner of the trail with a broad smile on his face. 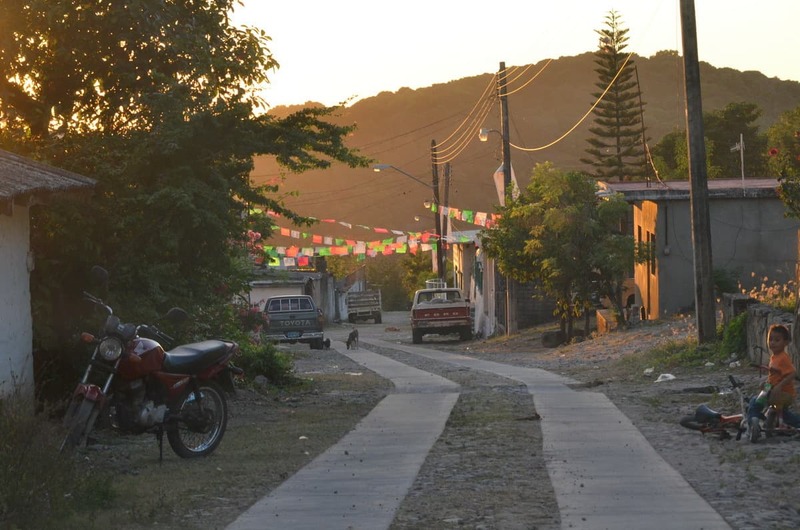 We managed to exchange enough words to determine that the rider was returning home to La Bajada from his day’s work in Jalcocatan. 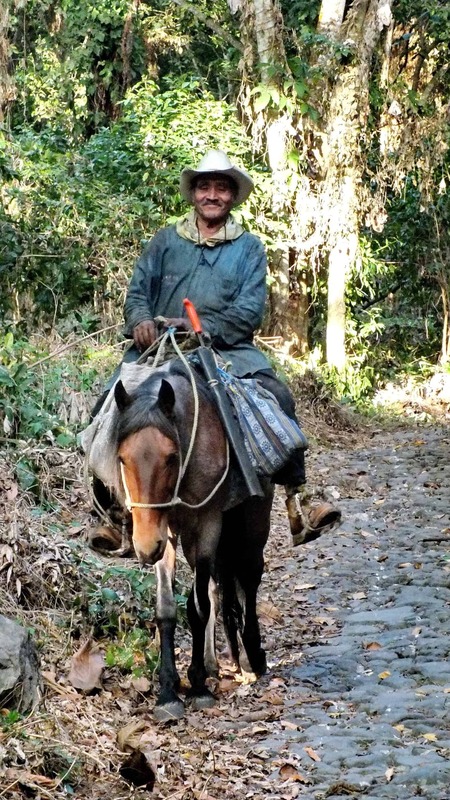 We noted that he had a machete hanging from his saddle. Three dogs had led the way, leading the friendly stranger onwards. By 4:30 p.m., the encroaching shadows convinced Bob and me that it was time to end our hike and start walking back to the car. 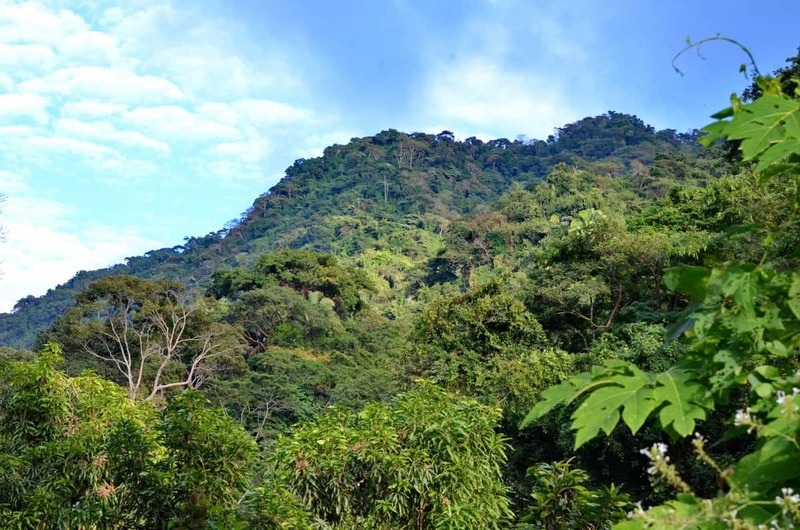 Higher up the mountain, a coffee plantation in the shade of the jungle canopy coexists with the natural environment, but workers would have gone home for the day. and a golden glow was cast over La Bajada where it nestled at the base of the mountains. 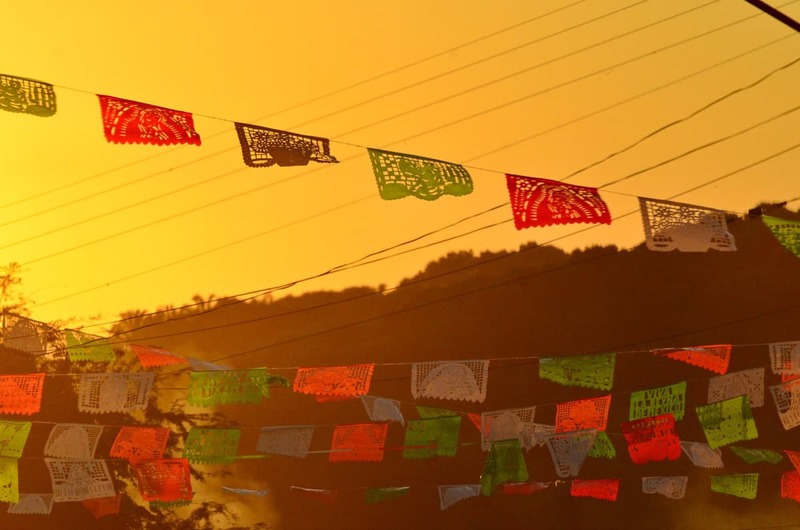 The strings of ornate bunting swayed lightly in the breeze nudging us to contemplate the ancient form of Mexican folk art used to create them. 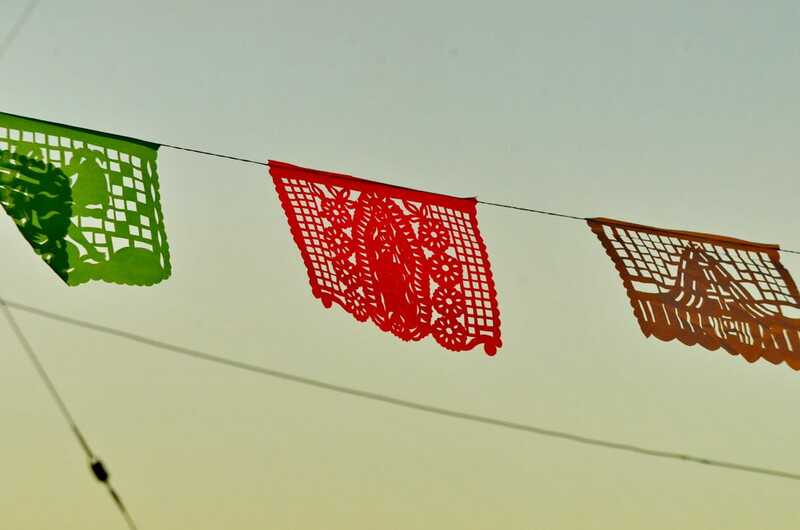 These lacy cutouts called Papel Picado represent a tradition dating back to Aztec times. Then, a type of paper made from tree bark was used, but now, the patterns are cut from stacks of coloured tissue paper using small chisels and a template. The elaborate cutouts serve as decorations for any number of celebrations. For us, they represented a colourful sendoff back to our hotel in San Blas. It had been a good day!